Drinking water safety notice, New York City. Courtesy of Susan Sermoneta, CC BY 2.0. At this point, it is reasonable to ask: how many residents are directly exposed to the dangers posed by fracking? Russell Gold and Tom McGinty report in the Wall Street Journal that, as of last year, at least 15.3 million Americans lived within one mile of a fracking well. In other words, fracking wells are becoming an unsightly presence in many U.S. backyards, posing still poorly defined and, in the current conditions, almost unavoidable risks to these households. 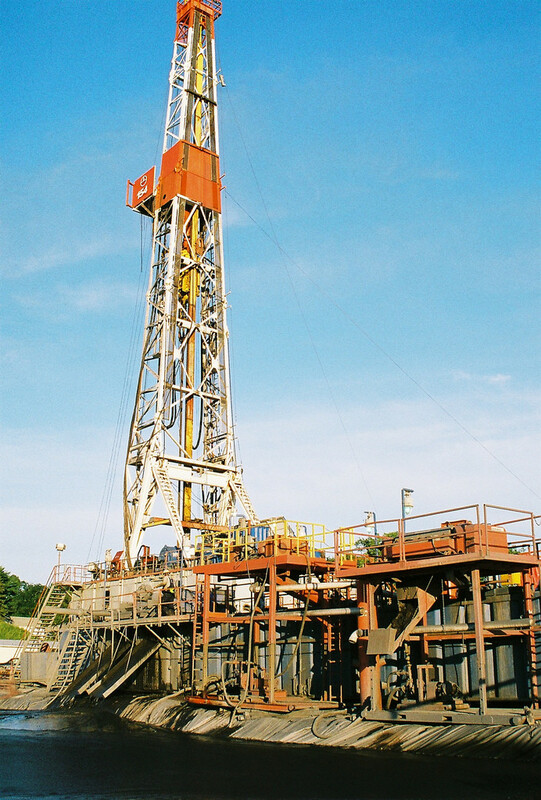 A well requires “truck-sized containers of water and sand, mixers, stadium lighting, pumps, chemical storage, and injection vans and recreational-vehicle command centers to orchestrate the operation.” Unsurprisingly, fracking is frequently considered a disruptive force by communities around the country. However, a combination of Wall Street financing and rapid technological innovation is leading to more and more fracking despite an absence of appropriate measures to ensure safety; our understanding of the risks associated with fracking remains very limited. 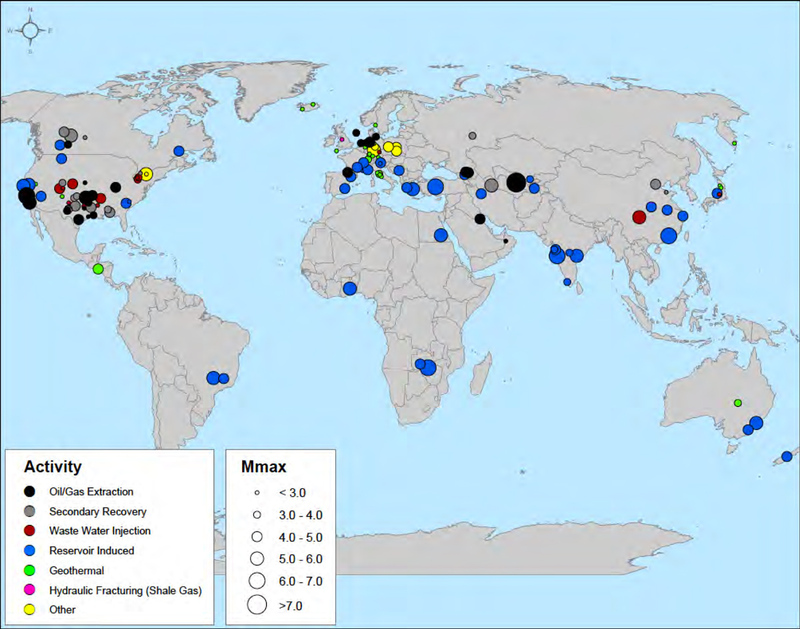 For example, in a recently published article, Jackson and other collaborators speculate that the presence of methane in drinking water could represent a precursor to other toxins, including arsenic, radioactive radium and other metals. Although the researchers do not yet know whether or not this is the case, a few recent studies suggest that it is a possibility. Results from the largest independent study on the impact of fracking on residents suggest that fracking could be associated with adverse health effects in people living in proximity of the drilling operations and support the need for further research into the impact of fracking-related activities. As reported in The Washington Post, Katie Brown, spokesperson for the pro-oil and gas-drilling group Energy in Depth, said the study was “just a poll” that contradicts evidence from direct measurements and that the fracking sites are closely monitored for possible pollutants. 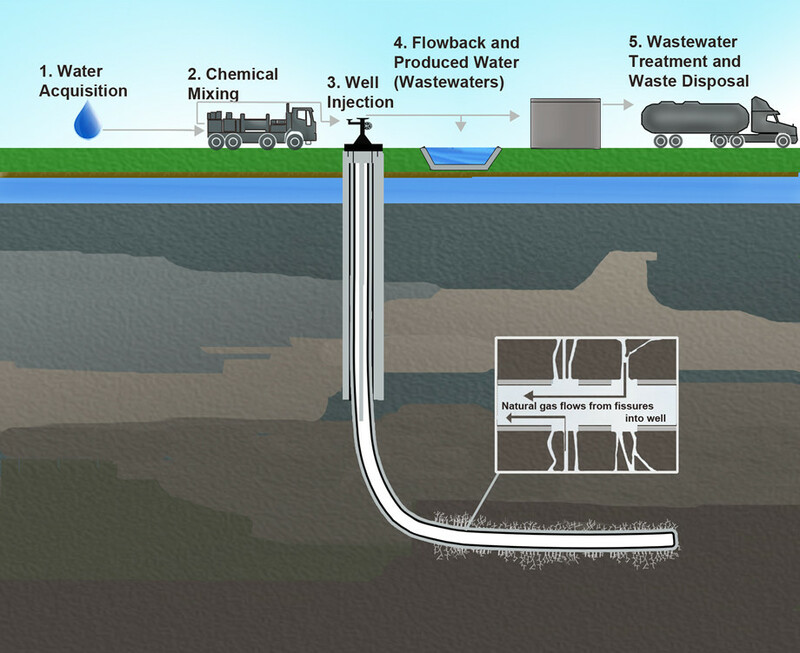 Fracking drill and wastewater pond, courtesy of Ari Moore, CC BY-NC-SA 2.0. About two weeks ago, eight conservation biologists from various organizations and institutions wrote that the exponential growth of the fracking industry in the U.S. has vastly outpaced our understanding of its environmental impact. In addition, they identified threats that include surface and groundwater contamination, diminished stream flow, stream siltation, habitat loss and fragmentation, localized air, noise and light pollution, climate change, and cumulative impacts. They call on scientists, industry, and policymakers to determine and minimize the effects of fracking on nature and wildlife. We can all agree that it’s time to close the knowledge gap, establish research priorities, and clearly identify the environmental and health risks associated with fracking operations. Clean freshwater may be the ‘gold’ of the future. We kill what we love, in a mad rush to profit. Are we really trying to turn gold into lead, and then have to drink it??? 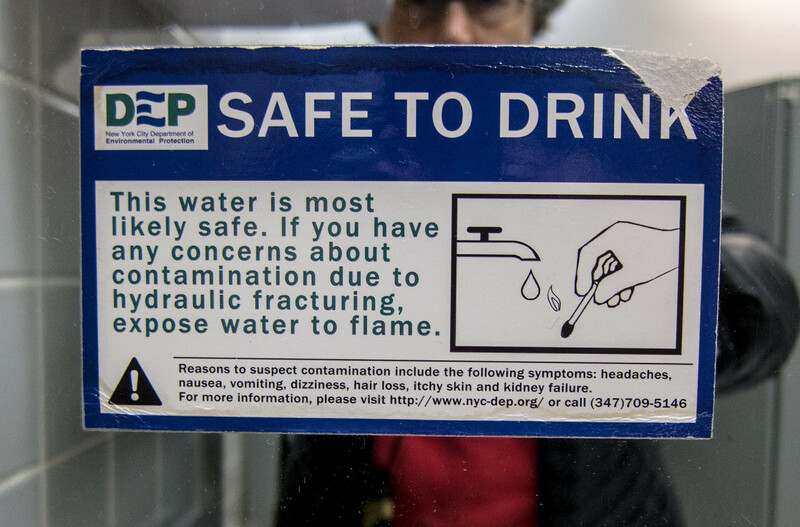 The environmental damage caused by fracking is undeniable. The water supply has been spoiled around the U.S. due to mismanagement, carelessness and the rush for riches in total disregard of one of our most precious resources. Water is what will determine our future, and if we try to imagine what our future will be on the basis of our current disregard for water, we won’t create a nice picture. The gas industry benefits from lax oversight. It is exempt from much of the Safe Drinking Water Act and parts of the Clean Water Act. As expected, the industry resists any attempt to improve oversight and it’s not held accountable for the damage it’s causing. How many more gas well blowouts similar to the type that occurred in Chesapeake Pennsylvania and spilled drilling chemicals in waterways do we need to hear about, before things start to be seen in the correct perspective? Yes, short term thinking is leading to the rush to turn gold into lead. The problem I see with fracking is that there isn’t enough regulation. Companies are allowed to use toxic chemicals that eventually end up in our water and soil. Ultimately, who is responsible for regulating fracking and making sure our drinking water isn’t contaminated? I looked it up and it looks like the EPA is considering rules requiring major fracking companies to disclose the chemicals they use. http://www.bloomberg.com/news/2014-05-09/epa-considers-requiring-disclosure-of-fracking-chemicals.html. The concept is that if companies are forced to disclose the toxic chemicals they use then they may be pressured to use less toxic chemicals. It is a small step but hopefully it will reduce water contamination of chemicals that may later lead to cancer and other diseases. I do agree that this is a step in the right direction, but how long will it take the EPA to ‘figure out’ the most efficient methods of collecting all information from each fracking event and does this information really seem to have my best interests at heart or is “big business” transparently their golden child? It appears to me that the EPA is trying to stall this regulatory process for potential gain, but I can’t figure out exactly who benefits during this period of lackadaisical regulation – is it personal or are they indebted? It’s time for the self-proclaimed defender of our environment (i.e. the EPA) to come clean and let us know why the activity of energy agencies isn’t being meticulously monitored and regulated. Be honest with those that you supposedly “care” about and want to “protect” – the U.S. citizens. Let us know what’s really going on. Attempt to make us understand why it took you almost three years to issue a response to a simple, should-have-been-obvious, petition request from your customers – the citizens. It was on August 04, 2011 when you first received this petition and it took years to get a response from you – May 19, 2014 to be exact. Why the lag in time – why are you just now acting like my opinions about fracking management matters [advanced notice of proposed rule making]? I thought that you already established chemical risk management in 1976 under the Toxic Substances Control Act so that you could (and would) protect us from chemicals and unreasonable risks. With 38 years of experience in evaluating, assessing, mitigating, and controlling risks, I believe it is time to go ahead and apply the skill-set you possess because I can’t imagine that you are being this irresponsible on purpose. Do my opinions really matter? Little I knew about this whole situation of “fracking” and the consequences that it brings to the U.S. It seems that the U.S. is not the only country affected by this process. Actually, fracking has generated protests around the world due to several environmental and health impacts that this blog in particular mentions. According to a new report from the World Resources Institute, some countries that are dealing with this issue are: China, Pakistan, India and Mexico. In the third world countries, people allude that the industry have went too far with this issue since the industry is not respecting people’s basic rights when it comes to health terms. What caught my attention about this fracking situation is that it does not only affects the health of ones drinking the contaminated water but it also affects the health of workers at the fracking site. Since I live in Georgia, I was concerned how this state is handling this dilemma. What I found is that there is no fracking in Georgia as of now since this state does not posses natural gas reserves. However, I think it is beneficial for Georgia to cooperate with the research that other states are conducting to find a way to ban this process like other countries did already. Water contamination is one of the most worrisome aspects of fracking, but we should keep in mind everything else that goes along with it, including air pollution and habitat fragmentation. There is more, for example noise pollution is a big one too. Put all of these together, and you can imagine how stressed wildlife must be around the fracking wells, and even at distance. You can look at this under many points of views, the human impact, the wildlife impact, the toxic impact on air, soil and water, there is so much to it. Adding to these already huge problems is, as the blog editor points out, that we don’t know much about the entire thing. And I want to make sure everyone understands one of the major problems here: baseline studies are not done before a new well goes up, so how can any study be meaningful? We should start by assessing what’s there before the well goes up, and then track all the changes caused by it. Only then the gas industry will be forced to take a look at the environmental disruption that it’s causing. Several problems exist that strongly tend to keep baseline monitoring from being done. With a revolving door coziness between Industry and the ‘Enivironmental Protection Agency’, with CEOs moving into leadership positions within EPA and then subsequently rotating back into industry roles… the fox guards the henhouse. This politic sets the tone for state legislators to resist any potential baseline monitoring funding prioritization by state water quality responsible agencies, for fear of having even more funding for what ever other good work the agencies might be doing… yanked by the legislature. Co-workers and friends in agencies would then be faced with downsizing. If the legislators don’t want monitoring funded, there will be no meaningful funding of baseline data gathering, nor for ANY substantial pointedly investigative environmental monitoring. Much of this problem stems from the mistaken belief by legislators that water quality monitoring is inherently politically and fiscally subversive. This belief is ‘short term thinking’. Monitoring is just exactly what SAVES us money, far more money than would be needed for doing the assessment. If we don’t discover our mistakes in a timely fashion we have to continue to making, and paying on into the future. WE pay with our own funds, our health, and the future health of our great grandchildren. All of these externalized costs are not taken into account for corporate ‘profit taking’, and We end up having to pay. These costs need to be accounted for. Monitoring is what scientific method depends on. The monitoring is essential. And, legislators are who we pay to figure out how to fund ‘that which is essential’! I’m surprised at the fact that the states are ignoring the quake potential that can be caused by fracking. I did some research and found that even though earthquakes that are fracking-related are thought to be minor, a new study shows that they can possibly trigger larger earthquakes. In 2011, an earthquake in Prague, Oklahoma, with a magnitude of 5.0, triggered another earthquake a day later that damaged 14 homes was found to be at a 5.7 magnitude on the seismic scale. Even though it is said that there currently is no direct link to hydraulic fracturing in this case, I would be curious to see what future research can tell us about this process in relation to earthquakes. As concerned as we should be about these “small quakes,” as they say, we should be worried about the possibility of larger destruction that can be associated with them. I was curious to see how many earthquakes we have across our country that are man-made and I found that the USGS tracks all earthquakes across the world. It came no surprise to me that the majority of the earthquakes found across the US are indeed man-made. Since the process of fracking is so new, I’m concerned about the quakes that are a result of the waste-water injection across the mid-west.